HomeFashionHere's how Salman Khan's look for 'Race 3' was created! Bollywood actor Salman Khan's latest Eid release 'Race 3' has been getting quite some mixed reviews from critics and audiences alike. While the film may be working its way upwards, one thing's for sure. Everyone seems to be going absolutely gaga over how dapper and hot Salman looks in the film. What's the secret you ask? Well, his designer Ashley Rebello, with whom Salman has been working since the 90's, designed the attires to make Salman look absolutely dashing. And we must say his attires seem to have worked like a charm on the audience. Here are some of his looks from the film. In the first look, Salman is seen donning an ink blue blazer, which is teamed up with a slate grey trouser and a tone on tone shirt in the same shade. There is a crest on the pocket that makes for a beautiful addition. Here, Salman can be seen in a Hugo Boss suit that was teamed up with a deep burgundy shirt and a red Hugo Boss tie. His look is tailor made to give the appearance of a business tycoon. This one is a hand-crafted leather look in different textures of carved leather. It is paired with a simple black T-shirt and his favourite Robbin jeans. This one is a denim on denim look. The jacket being distressed and frayed, gives a threadbare look. This jacket is the new look of the season with the side stripe jacket. Well, we're certainly in love with his looks from the film. What about you? 1Here's how Salman Khan's look for 'Race 3' was created! 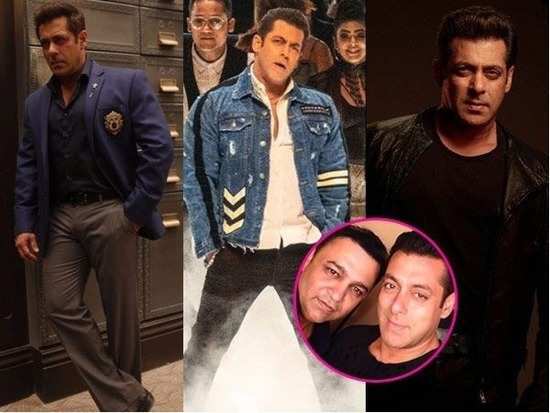 2Ace designer Ashley Rebello designs an outfit for Salman Khan this Eid! 3Priyanka Chopra just styled one top in 2 crazily different ways and no one even noticed! 4Priyanka Chopra's Jacquemus skirt is headline news itself! 5Kylie Jenner and Kim Kardashian West look like twins in matching skintight leggings! 6Did you'll notice how perfectly Anushka Sharma and Virat Kohli complemented each other's athleisure style? 7All the details we're loving about Priyanka Chopra's latest look! 9This diamond-encrusted Hermes Birkin might break the record for the most money paid for a handbag! 10'Dhadak' trailer launch: Janhvi Kapoor and Ishaan Khatter look picture perfect!